No matter if you are a novice at intarsia or a seasoned pro, here is an eye-catching project you will enjoy building, and one that any child will adore. 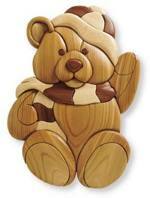 You will find full-size patterns for cutting out all of Teddys parts (including spacers for raised parts). Each pattern piece has labels that identify the wood color, grain orientation, and grouping for easier contouring of parts. Now, get ready to put your paws to work. We used pine and cedar and plywood, but you can use a wood of your choice. Scroll saw, drill, plug cutter, spindle or disc sander, and common hand tools. Just finished this project. Will send a pic. Great project.